Legal History Blog: Adkins's "Making Modern Florida"
In Making Modern Florida, Mary Adkins goes behind the scenes to examine the history and impact of the 1966–68 revision of the Florida state constitution. 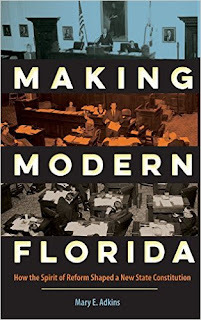 With storytelling flair, Adkins uses interviews and detailed analysis of speeches and transcripts to vividly capture the moves, gambits, and backroom moments necessary to create and introduce a new state constitution. This carefully researched account brings to light the constitutional debates and political processes in the growth to maturity of what is now the nation’s third largest state.